Take Highway 880 South, which will change into Highway 17. This becomes a mountain highway. Highway 17 ends in Santa Cruz and becomes Ocean Street. Turn left at the first traffic light on Plymouth Street. Turn right on to Water St.
Water St becomes Mission St. Turn right on Bay. 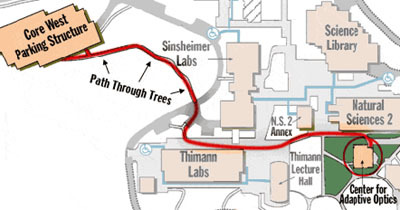 St and continue until you reach the UCSC campus entrance.